Creating a tri fold funeral brochures are very easy using our online funeral program software. Pick any Tri Fold Funeral Brochures Templates from our program library to get quick started. 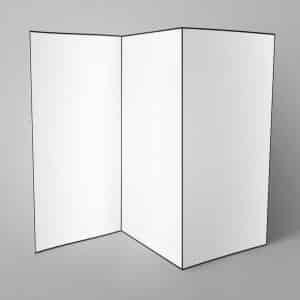 While editing online templates for tri fold funeral brochures, you will get 6 sides when folded. You can print this created Tri Fold Funeral Program on US Letter Size paper (8.5 x 11) and fold it. You can add a front cover, a back cover, a order of service text, an obituary text and a photo collage. This will make the Tri Fold Funeral Program more beautiful. You will have an option to edit unlimited and yes, print unlimited. 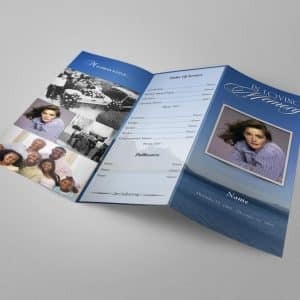 A Tri-Fold Funeral Program template called “Blank TriFold Funeral Programs Template“. This trifold funeral program template contains blank page their you can design your program as per your requirement. This Blank TriFold Funeral Programs Template contains 3 folds with 6 editable and printable sides where you can add your own content such as order of service details and other funeral service details. There is space to add photo and write obituary text to make it more attractive. A beautiful Tri-Fold Funeral Program template called “Ocean Trifold Funeral Program Template”. This trifold funeral program template contains eye catching blue ocean background and clear weather clouds which gives an appealing look to printable trifold funeral program. Get printable PDF downloaded to get it printed your own. This Ocean Trifold Funeral Program Template contains 3 folds with 6 editable and printable sides where you can add your own content such as order of service details and other funeral service details. There is space to add your family photos to make it more attractive. A beautiful Tri-Fold Funeral Program template called “Infant Trifold Funeral Program Template”. This trifold funeral program template contains infant baby background which gives an appealing look to printable trifold funeral program. 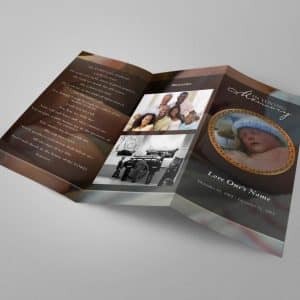 This Infant Trifold Funeral Program Template contains 3 folds with 6 editable and printable sides where you can add your own content such as order of service details and other funeral service details. A beautiful Trifold 8.5 x 11 Funeral Program template called “Irish Green Trifold Funeral Program Template”. 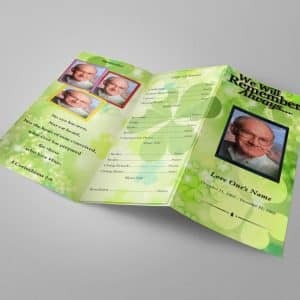 This tri-fold Irish Green Trifold Funeral Program Template contains infant irish green background and white inside pages, which gives an appealing look to printable trifold funeral program. This Irish Green Trifold Funeral Program Template contains 3 folds with 6 editable and printable sides where you can add your own content such as order of service details and other funeral service details.